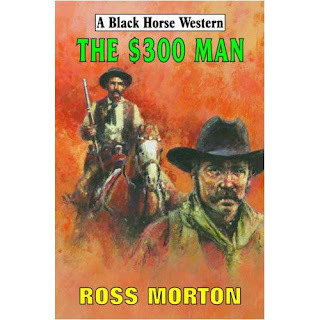 There are not many novels in the Black Horse Western stable that feature a female main character. This is one of them – and, like the Misfti Lil series, it works very well. Our first introduction to Ros West is memorable as she sells her horse. We want to know more about her and her predicament. But before that, we – and Ros – are drawn into a fight to rescue an apparent stranger, Jake Rudd from a beating. Ros has a strong sense of justice – and a missing memory. Good characterisation, plenty of action and an unfolding mystery – all bound to provide reader enjoyment. 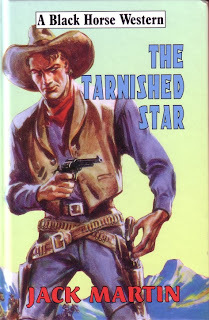 THE TARNISHED STAR by Jack Martin has become quite a phenomenon, even before it was published. Pre-sales thanks to astute exposure on the Internet have meant it has gone into reprint before its publication date of June 30. That’s a lot to live up to. Fortunately, the omens are good. It’s a traditional moral tale of the Old West and it begins with a bang. Sheriff Cole Masters is enjoying a smoke of his pipe – it may be his last. I liked that – the threat in the first paragraph hooks the reader. Cole has jailed young Sam Bowden for the murder of a prostitute. Up till now, Bowden’s been bailed out by his father, Clem, who all but owns the town. But murder is different. Cole is waiting for the judge to arrive in a few days’ time. He’s also waiting for Clem Bowden to confront him and break out his son. And besides Em, an old timer, and his schoolteacher fiancé Jessie, Cole has nobody to stand with him. Outnumbered and concerned for Jessie’s safety, Cole lets Sam go and takes a beating and loses his badge. Humiliated, he crawls away to lick his wounds. But Cole believes in the law – not a rich rancher’s version of it, either. Cole will be back. The spoilt brat (thirty-years’ old!) Sam is well drawn and totally unlikeable, even by his men and father. But blood’s thicker than common sense in the Bowden scheme of things, so Sam must be saved from himself. 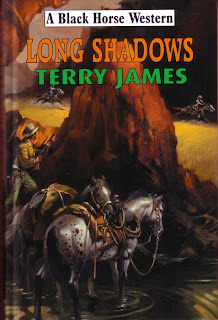 To do this, Clem hires two gunslingers, Quill and Boyd, to track down Cole. Jessie is a strong self-willed character too, especially when she stands up to old man Bowden. There are a number of dramatic scenes where the characters leap off the page, demanding sympathy and understanding. Plenty of action, a fast pace and a hero in the mould of James Stewart. All in all, this is a good debut novel and worthy of inclusion in the BHW stable. The Tehran Transmission: Chilling coincidence or what? On Wednesday, June 17 I received from my publisher a pdf of the cover of The Tehran Transmission. I was pleased with it. It's the hand that's relevant for this post. 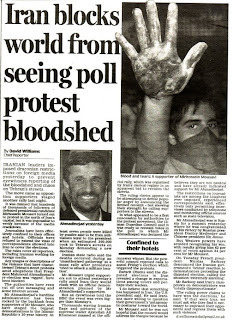 A couple of hours later, I went out to buy a Daily Mail and was surprised to note an article on Iran’s restrictions on foreign media – with a photograph of a bloody hand that seemed to echo the book’s cover. As my book is about the events leading up to the Islamic Revolution, there’s a certain amount of irony involved here, since the current Iranian government is using both the verbal excuses and tactics employed by the Shah the present regime ousted in 1978! Now if only Libros would get the book off the printer, perhaps some publicity could be engendered… I live in hope. ‘A man ought to do what he thinks is best.’ – Hondo Lane. Hondo and his trusty dog Sam are being stalked by two Apache warriors. He chooses the time and place for the showdown. This action-filled beginning is dropped from the film. Shortly afterwards, deprived of his horse, he wanders into a deep fertile basin and a lonely small ranch. This is where the film opens – and it works. Hondo meets up with Mrs Angie Lowe and her young son Johnny, both struggling to keep the ranch going in the absence of any man. Hondo befriends them and helps out. He warns them that Vittoro is on the warpath but Angie says they’ll be fine, they got along with the Apache. Hondo was half-Apache so understood; he borrowed one of Angie’s horses and left for the fort with despatches. It was a sad leavetaking because there was strong affection between them. How the drama is played out between the pioneer woman, the gunman and the Apache warrior makes for tense reading. This is such a good yarn that it’s quite humbling to note that it was L’Amour’s first novel, published in 1953. He went on to produce over 120 books with sales in the 300 million range. The film, starring John Wayne and Geraldine Page (making her film debut), was made in the same year. Other actors included Wayne’s pal, Ward Bond and pre-Gunsmoke James Arness. Hondo’s dog Sam was played by Lassie! L’Amour honed his craft by writing many short stories before embarking on a novel-length tale. Sadly, there is no longer such a good market of pulp magazines for new writers to supply, where they can develop and improve their writing. 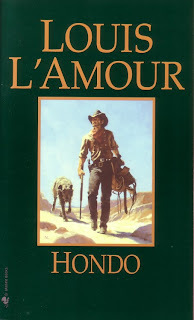 On a few occasions, L’Amour jumps character point of view between Hondo and Angie, Hondo and Ed Lowe etc in the same scene, but it’s forgivable because the characters and story smoothly move you on. Even if the viewpoint is omniscient, I found those particular jumps jarred a little. I also felt that the fast-paced ending seems a little rushed but it’s satisfying nevertheless. It was interesting to see that the film’s final confrontation between the Apache and the settlers and cavalry was lengthier than in the reading; much of the violence wasn’t actually shown in any graphic detail, which probably had something to do with the film code of the time. Wayne was already a big box office star. This film did his career no harm at all and the Hondo Lane character can rightly join the Ringo Kid, Ethan Edwards and Rooster Cogburn in the Wayne hall of fame. Bearing in mind this film was released in 1953, its treatment of the Apache was honest and sympathetic – as was L’Amour’s. L’Amour states in the Foreword: ‘I do not need to go to Thermopylae or the Plains of Marathon for heroism. I find it here on the frontier.’ As do we, his readers. What’s a life worth? $300, maybe. Half Mexican Corbin Molina lost a hand during the Civil War but he has adapted. Now he’s on a mission to Walkerville. On the way, he prevents a train robbery and finds an old friend. Corbin always carries $300, which is significant, since that’s what he was paid as a substitute soldier for the Union. When Corbin starts asking questions about Walkerville’s law and administration, he discovers that the Walker family, who seem to have bought and paid for loyalty and position, dominate the townspeople. Inevitably, Corbin’s questions attract plenty of trouble. And his past emerges to confront him during a tense showdown that threatens not only him but also his newfound love.